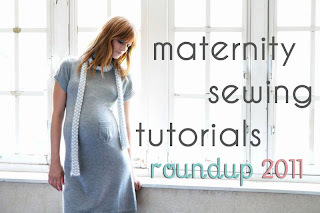 Throughout both pregnancies, I have slowly been bookmarking websites that have DIY instructions to make your own maternity clothes. Mostly this is because I'm very cheap frugal and hate paying full price for something that I will only wear for a short time. Also, because I live about an hour away from the nearest mall. Lots of other bloggers have already compiled similar lists, and links that I had already saved on my browser popped up on these lists as well. 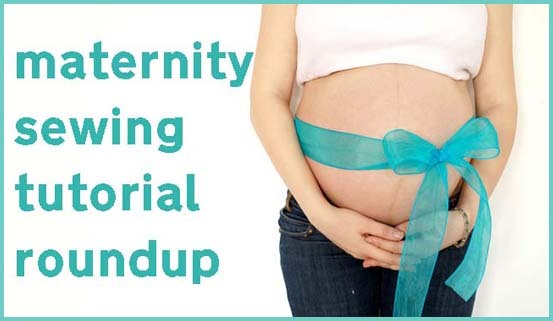 Here are a few links that I'm planning on using to make my own maternity wardrobe, as well as some of the "link roundups" that other bloggers have compiled. I found Megan Nielsen's tutorial on adapting a pair of non-maternity pants into mat-pants to be the most helpful, and that's what I used to make a waistband for the maternity capris I made recently. Megan said she carries her babies very low, which apparently I do too! So this method worked really well for me. I plan on using her tutorial to convert an old pair of regular jeans into some bump-friendly jeans pretty soon. 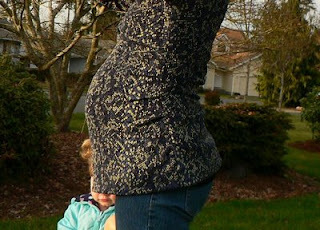 Lately my bump has been aching a little bit, just as things have been stretching out. I might find that I will need extra tummy support as I get a bit bigger... In that case, I will have to use Grosgrain's Maternity Pants tutorial to add a larger tummy panel. We shall see though... I have 2 pairs of thrift store pants that have the full maternity panel and I find them a bit too big for me. I'm also planning on making my own version of this adorable skirt by kojodesigns. I love everything about it - the vintage looking ruffles, the length, the fact that it can easily be dressed up or down... love! Another source that I'm planning to use is some patterns from the book Handmade Beginnings: 24 Sewing Projects to Welcome Baby by Anna Maria Horner. There have been some really fantastic versions of both the Lingering Layers Skirt and the Mariposa Dress on the web! This is something I've been struggling with, as I don't want to wear anything too poofy which just makes me look 10 times bigger than I am. I need stuff that is dressy enough for my office job, but also cute things for wearing out with friends. Several of my tank tops are quite long in the body and have been working so far, but I'm really starting to expand now and won't be able to wear these for much longer. Also we're getting into cooler weather now so I need actual tops with sleeves. I really like this tutorial from Laura's Blog that shows how to alter a regular shirt pattern to make it bump-friendly. I'm hoping to use it to make myself a few casual t-shirts as well as making some warm jackets and/or bunnyhugs to keep warm this fall/winter. As this will be our first winter in Squamish, I'm not really sure what to expect. I'm pretty sure I will need a raincoat; although I might just make a waterproof poncho and be done with it. As stated above, I will definitely need a coat/jacket for the fall and winter. Not 100% sure what I'm going to do there... Any suggestions? I have lots of loose-fitting dresses that I can probably get away with for another month or so, but felt pretty frumpy in them without something to show off my "blossoming belly". I love the Early Empire Cinch belts from Handmade Beginnings (Anna Maria Horner - you are seriously unreal!!!). I adore the fun creations by Lindsay from The Cottage Home and hope to make myself at least one (if not two!). Also I'm debating making myself a bathing suit. Since I have a ridiculously long torso, one-pieces don't normally fit me. So all I have are bikinis. I don't know if I will be doing any swimming before January anyways so perhaps I won't need one? I dunno... I might use the Cindy pattern from Burdastyle. 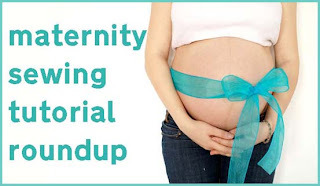 First up are 2 link roundups from the awesome blog Luvinthemommyhood. This gal is seriously creative and has a ton of awesome tutorials available on her blog. We also randomly have a mutual friend "in real life". Small world! 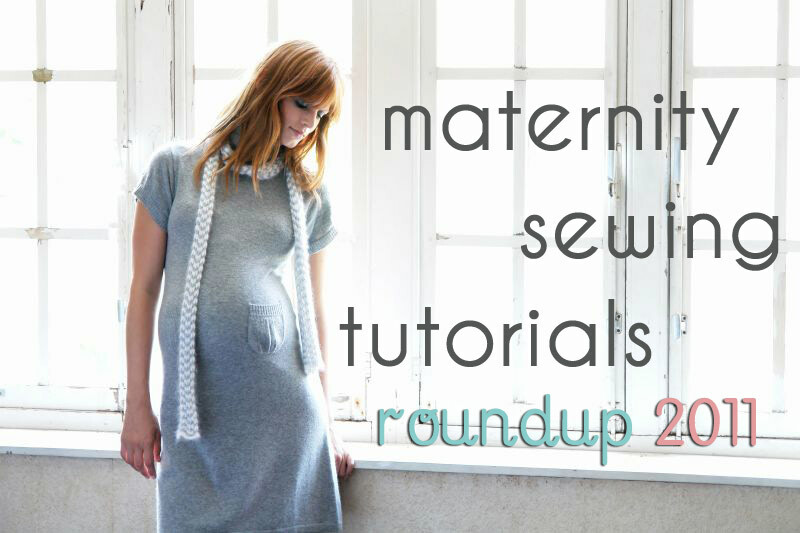 Next up is the also totally awesome blog DIY Maternity which has a ton of tutorials and projects for the self-made mama-to-be. Megan Nielsen has also designed several sewing patterns that are for sale on her site. I love this wrap maternity top... and the rest of the patterns as well! So that's pretty much it for now... I will probably be doing several posts in the coming weeks as I try and tackle many of these projects. Hopefully this will kick start some inspiration for folks out there as well - if not for yourself, but perhaps for an expecting mama in your life? Thanks for the link luv! Great post! Great links, thanks for sharing. I think it's best way to make your own maternity wear. Thanks for this wonderful article.